Mogi: Mirae Asset and Daewoo Securities merged last year to create Korea's largest IB. February 13 (MSE) Based on the Order No. : 63 of Chair of the Financial Regulatory Commission, dated on 27 January 2017, name of "Daewoo Securities Mongol UTsK" changed to "Mirae Asset Securities Mongol UTsK" LLC. February 13 (Mongolian Stock Exchange) Mongolian Stock Exchange organized 5 securities trading sessions and made transaction of MNT2.4 billion , with daily average of MNT12,359,331,173.00 in period between 06 February 2017 and 10 February 2017. 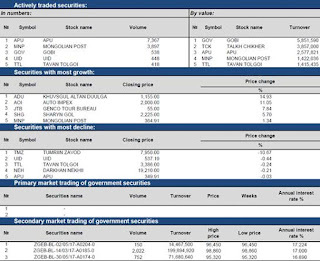 391,600.00 shares of 40 joint stock companies worth of MNT115,594,333.00 were traded. 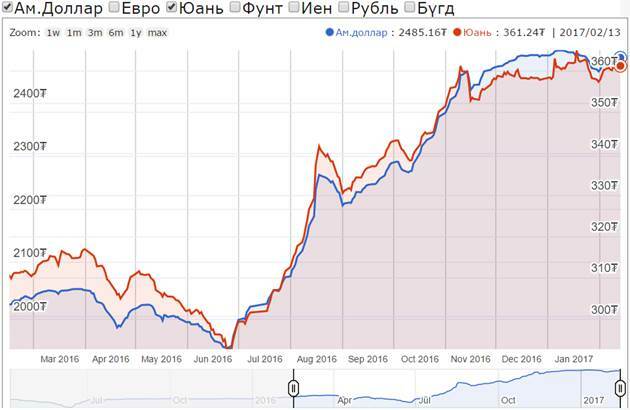 120,000 Government retail bonds worth of MNT11,542,440,000.00 traded through one trading session. 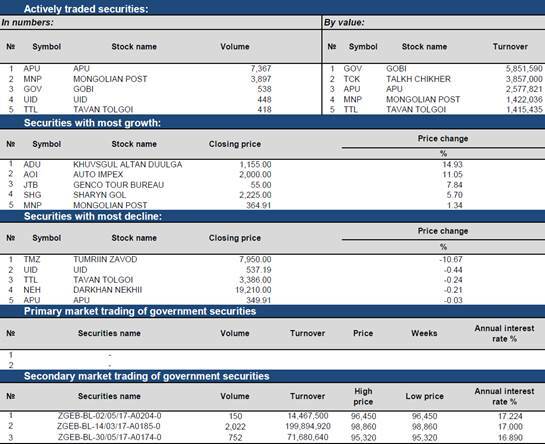 950 government retail bonds traded on secondary market of Government securities trading and total of 91,684,500.00 transaction has been made. As of 10 February 2017, market capitalization was MNT1,428,531,907,985.00 which indicated decreases of 0.36% and MSE ALL index reached 828.53 units which indicated decreases of 0.33% from the previous week. February 13 (Bloomberg) -- The Development Bank of Mongolia law was amended by parliament on Friday, with the changes including 13 provisions recommended by the International Monetary Fund, keeping the door open for a bailout. The bill goes into effect on April 1 and was supported by 41 out of 53 MPs, according to a live television broadcast on Friday. The amendments seek to depoliticize the bank and include a rule that board members can't have held political office in the past five years. Mongolia is currently in negotiations with the IMF for a bailout as the government is facing large debt repayments amid an economic downturn. The development bank is facing a $580 million repayment in March and the sovereign will need to repay $500 million of Chinggis bonds in January 2018. If the IMF is going to pay off Mongolia's first sovereign bonds, they need to make sure that the DBM is governed by principles and not by politics, and this bill is meant to do just that, Munkhdul Badral, head of market intelligence firm Cover Mongolia, said in an e-mail. "I expect initials details of the IMF agreement to come out within the week." An agreement with the IMF will facilitate additional loan agreements with Asian partners, preventing the country from defaulting, according to a research note by Emily Stromquist, an analyst for the political risk consultancy Eurasia Group. Japan, South Korea and China are possible partners for additional loans. "The IMF is considering an Extended Fund Facility, which typically comes with very strict conditions concerning deficit and expenditure reductions. The benefit of this arrangement is that it could provide Mongolia with several billion dollars of assistance rather than the $450 million or so initially discussed," according to Stromquist. Eurasia Group adds that IMF conditions include an increase in the value-added tax from 10 percent to 15 percent, cuts to social welfare benefits, and a reduction in government expenditures and the budget deficit. "Lawmakers are hesitant to introduce the social welfare cuts, particularly with presidential elections looming on the horizon in June. This is one of the issues that is believed to be holding up the submission of a final deal to parliament for approval," according to Stromquist. While a loan from Japan is expected to carry a higher interest rate compared to one from China, it would also incur less political risk, according to Stromquist. "The Mongolian People's Party (MPP) is extra cautious at this time about appearing to sell the country for cheap to China," she wrote. An IMF bailout would only be successful if it was followed by infrastructure projects that can increase Mongolia's mineral exports, Nick Cousyn, COO of Ulaanbaatar-based broker BDSec, wrote in an e-mail. "Mongolia still relies on border crossings into China via truck for their mineral exports, creating a severe bottleneck. Export growth will remain constrained until they can complete their rail project into China, which should be a top priority," said Cousyn. February 13 (CNBC) London copper hit its highest levels in 20 months Monday as closures of two of the world's biggest mines amplified concerns of a supply shortage. In early trading Monday, the three-month London Metal Exchange contract rose 0.10 percent to $6,097 per metric ton, its highest level since May 2015 and a continuation of the upwards trend seen since last week, when production was halted at two key sites. Miners in Chile's BHP Billiton site, the world's largest copper mine, last week walked out over a wage dispute, prompting the firm to announce Friday that it would not meet its upcoming contractual obligations on metals shipments. Meanwhile, an export ban has caused Freeport-McMoRan to cease work in Indonesia after it failed to reach an agreement on a new mining permit with the government. Prices leapt 4.4 percent Friday as tensions heightened, taking the metal to a 17-month high. Since then, Reuters reported over the weekend that more than 300 vandals broke into property at BHP Billiton and forced contracted workers to stop working, causing the metal to rise to $6,204 a tonne in volumes of around 8,000 lots in Asian trading Monday. But does this signal the start of a chain reaction for base metals or, rather, does it say precious little? According to a press note from Kit Juckes, macro strategist at Societe Generale, it's a sector worth watching, "given the tendency for commodity prices to correlate." However, Vivienne Lloyd, senior analyst at Macquarie, believes the impact is set to be more limited. "Copper rallying has a bullish effect on the other base metals, as we saw last Friday, but less so on other commodities such as energy," she told CNBC by email. "It seems more likely to be a short term rally based on recent disruption events," said Lloyd, who believes a long-term run is unlikely. "A sell-off when (BHP Billiton) goes back to work would be the most probable trigger for a reversal," she said, however suggesting that the troubles for Freeport-McMoRan in Indonesia could be somewhat greater. "In the interim, however, uncertainty remains around Grasberg (Indonesia). We think PT Freeport Indonesia will move to reduce operations this week due to the export ban, which is likely to spark another short term up-trend." Today's market shifts are also riding on the impact of stronger-than-expected Chinese data released last week, in which exports and imports were up, subsequently boosting metal prices. February 13 (MarketWatch) Gold futures fell Monday, on track for their largest single-session loss of the month as the dollar flexed its strength against most major currencies and U.S. equities gained, dulling the appeal of the precious metal in the short term. April gold fell $12.30, or 1%, to $1,223.60 an ounce. Prices haven't seen a dollar or percentage drop this large since Jan. 25. Gold futures ended lower Friday, but finished the week with a gain of more than 1%, for its sixth weekly rise in seven weeks. The ICE U.S. Dollar Index edged up by 0.2%. It traded higher against most currencies, except for the British pound, which strengthened ahead of what could be hotter U.K. inflation in a reading due Tuesday. Gold is traded in dollars, so moves for the U.S. currency can influence the metal's attractiveness to those using other monetary units. U.S. equities also climbed, with major indexes hitting another round of records, drawing investor attention away from the precious metals. March silver lost 13.8 cents, or 0.8%, to $17.795 an ounce, coming off a weekly rise of 2.6%. "There are intraday [gold] sellers looking for signs of trend reversal," said Chintan Karnani, chief market analyst at Insignia Consultants in New Delhi, adding that he expects gold demand to rise if prices fall to the $1,190 level. This week, investors will hear from U.S. Federal Reserve Chairwoman Janet Yellen, who will appear before the Senate Banking committee on Tuesday and the House Financial Services Committee on Wednesday. "I think there's a good chance that she'll stress that the March FOMC meeting is a 'live' one, i.e. that they could raise rates then," said Marshall Gittler, head of investment research at FXPrimus. "The market currently gives that idea only a 30% probability. If she does, [the dollar] would move higher." Among other metals traded on Comex, March copper tacked on 2.1 cents, or 0.8%, to $2.789 a pound, but April platinum fell $14.30, or 1.4%, to $997.40 an ounce and March palladium lost $7.35, or 0.9%, to $775.75 an ounce. The exchange-traded fund SPDR Gold Trust was down 1.1%, while the VanEck Vectors Gold Miners ETF fell 0.9%. February 13 (Sydney Morning Herald) The price of iron ore has scaled new heights in recent days but most mining analysts are proving reluctant to update their forecasts on key mining stocks to match. The iron ore spot price rose 3.3 per cent to $US86.62 a tonne on Friday – a 2½-year high. Chinese iron ore futures, dominated by speculators, soared higher to hit $US100 a tonne on Friday and $US101.50 on Monday. Many investors had expected iron ore prices to fall off after the Chinese New Year, believing that stockpiling before the holiday had been driving the recent rally. However, Chinese buyers returned last week to drive fresh gains for the iron ore price. The price is significantly above the level that analysts had pencilled in for the metal at the start of the year. Macquarie, for example, factored in an iron ore price assumption of $US61 a tonne in its report on BHP last Friday, up from a $US54 a tonne price forecast in January. UBS's estimate puts iron ore at $US56 a tonne, with an upside scenario of $US66. Credit Suisse's forecasts are for $US65 a tonne this quarter falling to $US52.5 by 2018. Following Rio Tinto's result last week, Citi upgraded its 2017 iron ore forecast 15 per cent to $US65, which is still below current prices. Indeed, price estimates are also above the internal estimates used by many mining stocks to guide their own profit forecasts, said Citi head of equity strategy Tony Brennan. "Prices aren't yet fully factored into earnings estimates," he said. "Not just for iron ore, but for oil and other base metals too. Particularly for fiscal year 2018," he said. "This has meant earnings estimates are lower than they would be if current commodity prices continued indefinitely." However, analysts aren't rushing to match their 2017 estimates to iron ore spot prices. Global commodity analyst at UBS Lachlan Shaw said what mattered wasn't so much where iron ore is now but where it will go. "[It] comes down to demand for steel. We continue to see long-term steel demand risk, particularly in China. The incentive is for supply to lift, and if it lifts aggressively, and you've got demand growth that can't keep up, prices will need to come back. "We're certainly in that camp. We think current prices are unsustainably high. On a 12-month view, we would expect those prices to trade lower." An iron ore price at $US86 or $US87 a tonne is well above the cost curve and above the price it needs to be to trigger a new investment cycle in iron ore mining, Mr Shaw said. "If the industry starts to believe this price is sustainable, we will see another investment cycle." Few expect that to happen. Mr Brennan said he expected iron ore prices to come down in the second half of 2017. "Global production, particularly from low-cost producers like Australia and Brazil, will grow again in 2017. And the production of steel, which is the main use of iron ore, won't grow equivalently." LONDON, February 13 (Reuters) Oil fell more than 1 percent on Monday after an OPEC report showing high compliance with last year's landmark production- cut deal underwhelmed investors while signs of rising U.S. crude output continued to weigh on prices. Global benchmark Brent crude futures were down 96 cents at $55.74 a barrel at 1518 GMT and touched a session low of $55.65. West Texas Intermediate (WTI) crude futures were down 82 cents at $53.04 a barrel and traded as low as $53.01 earlier in the day. "The good compliance rate of OPEC seems to be priced in. The U.S. rig count from Friday is weighing, the numbers support the shale comeback story," said Frank Klumpp, oil analyst at Stuttgart-based Landesbank Baden-Wuerttemberg. U.S. oil drillers over the past month have added the most drilling rigs since 2012, bringing the total to 591 rigs, the highest since October 2015, oil services company Baker Hughes said in a weekly report. Speculators cut net long positions on Brent last week by 10,000 contracts, weekly ICE data showed, highlighting investor concerns about rising U.S. production. In turn, bullish gasoil bets rose to their highest level in four years as demand is expected to increase due to cold weather and maintenance. The Organization of the Petroleum Exporting Countries and other producers, including Russia, agreed late last year to cut output by almost 1.8 million barrels per day (bpd) during the first half of 2017. The group's first official data since then showed on Monday that OPEC member Saudi Arabia had cut more deeply than expected, taking compliance in the first month following the agreement to as high as 93 percent. Crude supply from the 11 OPEC members with production targets under the deal fell to 29.888 million bpd in January, according to figures from secondary sources which OPEC uses to monitor its output. But high compliance had been expected and the report failed to push oil prices into positive territory on Monday. Analysts at ABN Amro are skeptical about production cuts delivering higher oil prices and reduced Brent forecasts for the first half of this year to $50 from $55 a barrel. Ulaanbaatar, February 13 (MONTSAME) Mongolian Democratic Party held its 7th Assembly on February 12, Sunday to inaugurate its new Chairman S.Erdene, who was selected for the leadership of the party following an all-member election that took place on January 29. During the election, S.Erdene received votes of 35.8 percent of the supporters of the party or 12 polling units out 30 units stationed across the country, thus claiming victory. The inauguration ceremony was attended by more than 3300 members of the Democratic Party and leadership of the party including Z.Enkhbold, former Chairman of the party, L.Erkhembayar, acting Secretary-General of the party and E.Bat-Uul, Chairman of the Democratic Party of the capital city. "I extend my gratitude to all supporters of the Democratic Party who have stood their ground for democracy until now, and have helped reform the party. Although the Democratic Party is an opposition in this Parliament with few seats, the party is working on its mistakes and aiming for change", said former Chairman Z.Enkhbold as he transferred the chairmanship seal to his successor. He expressed his readiness to work with the new Chairman in order for the party to win the next election. In his opening speech, the new Chairman said, "I have fought since the winter of 1989 to safeguard democratic values. Today, we confront a historic challenge to maintain and advance Mongolian democracy. Having brought about democracy in a one-party system, the Democratic Party will continue to strive to nurture democratic development in Mongolia". He also said, "I will ensure correlations between the young, middle and senior generations of the party and gender equality. The Democratic Party can sustain the society the Mongolian people want. Together we will claim victory in the 2017 Presidential Election and 2020 General Elections". Acting Secretary-General L.Erkhembayar said, "It's time to navigate towards reform of mindset", entrusting the new Chairman to lead the party to reform of mindset. Following the inauguration, the Secretary-General was assigned to submit the new Chairman's name to Supreme Court of Mongolia. The 7th Assembly discussed the renovation of the Democratic Party's Main Principles, selection procedure of leadership of the party's National Consultative Committee and local committees and other organizational and functional issues. February 13 (news.mn) On 13th of February, the Mongolian General Election Commission held a press conference about preparation for the 2017 President Election. The State Great Khural (parliament) has approved a total of MNT 14 billion for the election. Candidates will be announced in May. The Mongolian Presidential Election will be held on 26th of June, 2017. According to Mongolian law, the election date must be announced 150 days prior to polling. However, Mongolians living abroad will be able to vote through Consulates and Embassies on 10th and11th of June. Ulaanbaatar, February 13 (MONTSAME) Secretary of the National Security Council of Mongolia Ts.Enkhtuvshin paid a working visit to Russia at the invitation of his counterpart on February 6-8. He met with Secretary of Security Council of the Russian Federation N.P.Patrushev to discuss issues on fight against terrorism, prevention from 'color revolution', cooperation between the organizations with special duties to ensure national security as well as other regional security concerns. The meeting was attended by Ambassador Plenipotentiary and Extraordinary from Mongolia to the Russian Federation B.Delgermaa and Chairman of General Intelligence Office B.Khurts. During the meeting, Mr. N.P.Patrushev noted that the Russian side supports proposals put forward by Mongolia and pledged to cooperate to realize them. He invited Mr. Ts.Enkhtuvshin to participate in an international forum of high ranking officials of national security organizations in May 2017 in Tver city of Russia. At the end of the meeting, Ambassador B.Delgermaa presented an Order of Polar Star to Secretary N.P.Patrushev. Mongolian President Ts.Elbegdorj bestowed the award upon him for his contribution to the strengthening of traditional historic ties between the Security Councils of the two countries. February 13 (UB Post) During the final meeting of Parliament's fall session, held on Friday, MPs debated a resolution put forward by Parliament's Standing Committee on Law (SCL) on the privatization of Erdenet Mining Corporation (EMC). Mongolian Copper Corporation (MCC) bought 49 percent of EMC and Mongolrostsevetment LLC from the Government of Russia and Russia's state-owned Rostec Corporation last year. 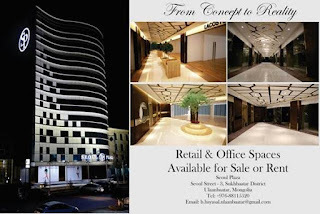 Following public and political criticism of the sale, a task force led by Head of the SCL Sh.Radnaased studied the matter. After a report on the task force's findings was made public, the matter became the center of public debate. The task force found that MCC had paid over 400 million USD to buy the 49 percent stake in EMC through illegally structured sources and broke a number of laws. The SCL discussed its findings on January 31 and February 10, and agreed that the sale was in violation of several sections of the Constitution and laws on Parliament, banking, and more, so they put forward a proposal to transfer the 49 percent stake from private ownership to state ownership by revoking the first index of Government Resolution No. 330, issued on June 13, 2016. President Ts.Elbegdorj attended the final fall session while Parliament reviewed the resolution on EMC. During the session, a number of MPs representing the Mongolian People's Party blamed the previous Cabinet for allowing the illegal sale, especially former Prime Minister Ch.Saikhanbileg, as Cabinet had issued resolution No. 330 without discussing it with Parliament. Some of the MPs underlined that there several people should be brought to justice for being engaged in the sale. Several MPs asked the task force if the Government of Mongolia could be called to appear in a court of arbitration if privatization was enforced. Parliamentarian Ts.Nyamdorj said that he hopes Mongolia will not have to appear in an international court of arbitration. He noted that a lot of evidence has been gathered to confirm that a number of laws were broken in finalizing the sale. He pointed out that Mongol Bank has no authority to grant loans to a private company, but Mongol Bank illegally granted a company involved in the sale 360 billion MNT. He said that the transfer of the 49 percent stake in EMC is the first step that needs to be taken to dismantle this system of stealing from the state. D.Erdenebat, Democratic Party member and former Minister of Industry under the previous Cabinet, said that Parliament's resolution to claim the stake sounds like a jury's verdict on sentencing, and that it is designed to capture private property, and it is a terrible action being taken against the private sector. He highlighted that rumors that an international court of arbitration would rule that EMC be required to pay off a loan from Standard Bank should be made clear to the public, and that issues concerning the state's 51 percent ownership of EMC are very important. He reminded the MPs that a letter was sent to Prime Minister J.Erdenebat from the CEO of Rostec Corporation, Sergey Viktorovich Chemezov, on February 9, stating that the 49 percent stake had already been transferred to its new owners in adherence to an agreement between the governments of Mongolia and Russia, and that changes to the agreement was could be harmful. After MPs spoke about the transfer of the stake to the government, President Ts.Elbegdorj addressed Parliament with his position on the matter. He disagreed with the resolution proposed by the SCL, and emphasized that he wanted an open discussion on the matter bringing all the sides involved together, and that it was unfortunate that no open discussion was going to take place. The President pointed out that the resolution could drive away foreign investors and entrepreneurs and that it could further isolate Mongolia. He added that a lot of state authorities are not adhering to the law and that EMC must follow the law on budget transparency, noting that there should be a focus on destroying the hidden and illegal business operations of EMC that have been going on for years. At the end of debate, the majority of MPs in attendance supported the resolution to transfer the 49 percent stake in EMC and Mongolrostsevetment LLC from private ownership to state ownership by negotiating the closing of loans, dividends, and promissory notes of Trade Development Bank that were issued by Mongol Bank and Development Bank of Mongolia. In making the session's closing remarks, Speaker of Parliament M.Enkhbold stated that Parliament voted on a number of bills, amendments, and resolutions during its 34 sessions and over 100 meetings of Parliament's standing committees held during the fall session. He pointed out that Parliament has worked to focus on fixing the policy failures facing Mongolia in recent years. He underlined that all the state's authorities have started carrying out a policy of lower spending, and they have also launched important actions to strengthen budget discipline by calculating income and spending with detailed financial assessments. The Speaker said that Parliament is concentrating on social protection and welfare despite the economic challenges facing Mongolia, and has taken several measures to help benefit targeted groups. He highlighted that Parliament also made decisions promoting herders and agriculture, as well as focusing on human health. Speaker M.Enkhbold emphasized that MPs should meet with their constituents to listen to opinions on the laws that were approved during the fall session and other issues, introduce the legislation to voters, and support the implementation of new and amended laws during the break before the beginning of Parliament's spring session. February 13 (Microsoft TechNet) The Mongolian government recently announced that they will not be observing DST going forward. DST was previously scheduled to begin on March 25th, 2017. Microsoft is preparing an update to Windows which will reflect this change. We anticipate this update will be made available before March 25th, 2017.We recommend our customers to keep their Windows devices updated to ensure the transition on March 25th, 2017 does not take effect. Summary: Parliament held its final meeting of the fall session and discussed key legislation before the session's adjournment. Members of Parliament approved a bill on Development Bank of Mongolia, requiring that loans granted by the bank will now be closely monitored. If a loan is granted that damages the bank, the bank officials who approved the loan will be held personally responsible for the damages. The new law will take effect on April 1st. Parliament voted to transfer Erdenet Mining Corporation's (EMC) privately sold stake to state ownership. A Legal Standing Committee working group determined that the sale of 49% of EMC to Mongolian Copper Corporation violated the Constitution and other laws. The 49% stake will be transferred to the state and Cabinet is set to implement the transfer. Summary: Procedures for issuing low interest (8%) mortgage loans were approved in October 2015. On February 10, 2017, a new procedural agreement was signed between the central bank and commercial banks to continue the 8% ipotek loan program. In accordance with the agreement, the commercial banks will cooperate with the Bank of Mongolia, the government, and Mongolian Mortgage Corporation to issue loans. The Chief Executive Officer of Golomt Bank, U. Ganzorig, noted that financing for ipotek loans should increase. Since the approval of the new procedural agreement, Bank of Mongolia has granted 111.8 billion MNT for the financing of the loans and resolved 1,646 ipotek loan applications. Summary: Erdenes Mongol LLC and MAK are set to sign documents to establish a joint venture company, marking the first public-private partnership in the mining sector. The company will conduct exploration, mining, processing, and production of minerals. Mongolian Gold Corporation (MAK) is one of the nation's biggest privately-owned companies and has conducted exploration at the Aduunchuluun, Khuut, and Nariinsukhait mines. Erdenes Mongol LLC is a state-owned company that manages the Government of Mongolia's interests in Erdenes Tavan Tolgoi, Baganuur, Shivee- Ovoo, Erdenes Oyu Tolgoi, and Mon-Atom. Summary: The American Chamber of Commerce (AmCham) in Mongolia unveils its 2017 Roadmap for Growth on February 13, 2017. The Roadmap for Growth outlines AmCham's 2017 policy priorities that will further advance its mission to build, strengthen, and protect business between the United States and Mongolia, and to actively promote Mongolia as a destination for American investment. AmCham Mongolia considers the growing, successful, and strong businesses of the private sector to be one of the most viable solutions to addressing a large number of Mongolia's social, economic, and health issues. In 2017, AmCham will strongly advocate for and showcase the success stories of AmCham members doing business in Mongolia in a broad range of sectors, to promote free enterprise, doing business in Mongolia, and to regain investors' confidence. In 2017, AmCham will mainly focus on four strategic areas, including facilitating greater access for businesses to competitive financing; encouraging economic diversification through the promotion of renewable energy and agriculture, as well as U.S. franchising; working to develop a well planned, strong, consistent, transparent, and enforceable legal and regulatory environment; and advocacy for and promotion of AmCham members' success stories to attract foreign investment. To promote Mongolia as a destination for foreign investment, AmCham will organize its annual U.S. Trade Mission to the United States in June, under the leadership of the Honorable Jennifer Zimdahl Galt, U.S. Ambassador to Mongolia, to introduce Mongolia to the new U.S. presidential administration and present Mongolia's business success stories to potential U.S. investors. February 13 (gogo.mn) Erdenes Mongol JSC and Mongolyn Alt LLC has signed an agreement to establish Erdenes Ashid joint venture to operate in geological exploration and research field. It has marked the first public-private partnership in mining and mineral industries. Erdenes Ashid joint venture will conduct geological evaluation and detailed exploration on mineral areas, process minerals based on deposit as well as conduct exploration and production. "Mongolia has vast resources of unexplored minerals. We are delighted to work with Mongolyn Alt LLC, the national leading company in the fields of research, mineral classification, calculation and evaluation of deposit reserves. Establishment of the first public-private partnership in mining industry is significant to ensure sustainable economic growth, increase export and produce value-added and competitive production that substitude import". Erdenes Mongol JSC has cooperated with Shine Shivee LLC establishing Erdenes Shivee Energy joint venture since 2016 with the aim to create coal reserves for Shivee Energy Complex project. Mongolyn Alt is experienced and leading national company in mining sector - from geological exploration to the mineral processing. Ulaanbaatar, February 13 (MONTSAME) On February 10, T.Tugsbilguun, Ambassador of Mongolia to Thailand met at the Embassy with Florian Bennhold, CEO of Bangkok-based Symbior Solar Energy Limited. During the meeting, Mr. Bennhold informed the Ambassador of his company's ongoing project with Mongolia's NovaTerra LLC to develop a 50-megawatt solar power plant in Umnugobi (South Gobi) province of Mongolia. The two sides will invest around USD 100 million in a solar power park located in Khanbogd soum (county) of Umnugobi province and the initial section of the plant is expected to be operational in the first half of 2018. On his part, Ambassador Tugsbilguun expressed his full support to the joint venture and briefed Mr. Bennhold on the Mongolian Government's policies in the field of energy. Moreover, they discussed the prospects of furthering cooperation in the field of renewable energy sector. ULAANBAATAR, Mongolia, February 13 – The American Chamber of Commerce (AmCham) in Mongolia unveils its 2017 Roadmap for Growth on February 13, 2017. The Roadmap for Growth outlines AmCham's 2017 policy priorities that will further advance its mission to build, strengthen, and protect business between the United States and Mongolia, and to actively promote Mongolia as a destination for American investment. AmCham Mongolia considers the growing, successful and strong businesses of the private sector to be one of the most viable solutions to addressing a large number of Mongolia's social, economic, and health issues. In 2017, AmCham will strongly advocate for and showcase the success stories of AmCham members doing business in Mongolia in a broad range of sectors, to promote free enterprise, doing business in Mongolia, and to regain investors' confidence. In 2017, AmCham will mainly focus on four strategic areas, including facilitating greater access for businesses to competitive financing; encouraging economic diversification through the promotion of renewable energy and agriculture, as well as U.S. franchising; working to develop a well planned, strong, consistent, transparent, and enforceable legal and regulatory environment; and advocacy for and promotion of AmCham members' success stories to attract foreign investment. To promote Mongolia as a destination for foreign investment, AmCham will organize its annual U.S. Trade Mission to the United States in June, under the leadership of the Honorable Jennifer Zimdahl Galt, U.S. Ambassador to Mongolia, to introduce Mongolia to the new U.S. presidential administration and present Mongolia's business success stories to potential U.S. investors. February 14 (The Chosun Ilbo) Korea has seen increasing exports of chocolate on the back of Korean pop culture across Asia. Chocolate exports totaled US$22.68 million in 2015, up 43 percent from $15.83 million in 2011, according to the Ministry of Agriculture, Food and Rural Affairs on Monday. Mongolia and Southeast Asian countries have become the fastest growing markets for Korean chocolate. In the last five years, exports to Mongolia rose by 309 percent, to Thailand by 205 percent and to Vietnam by 109 percent. Overall, 42 percent of Korean chocolate was exported to China, followed by 14 percent to Hong Kong and 12 percent to Japan. But imports still substantially outweigh exports. In 2015, Korea imported $211.4 million worth of chocolate, nine times more than exports, with 18.5 percent coming from the U.S.
Korea's chocolate market was worth W1.16 trillion as of 2015, accounting for 1.2 percent of the global market. February 13 (gogo.mn) GoGo News Agency has observed the effects of air pollution on children`s health and conducted blood lead test on 15 children aged 7-10 years, living in 5 different areas of Ulaanbaatar city for more than 2 years, such as Bayankhoshuu, Da Khuree (Technical market), Narantuul market, city center and Zaisan. Child living in Zaisan: 0 mcg/dL. ​The maximum lead level found in child lives in Bayankhoshuu, Songinokhairkhan district, the most polluted area of the city where levels of PM2.5 particulates reach 1000-2500 micrograms per cubic meter in winter. Songinokhairkhan district covers total of 1200,6 km2 areas and has 82,895 households. However only one-fourth of the households are living in apartment. Households living in ger district burn raw coal to survive harsh winter which resulting hazardous levels of air pollution almost everyday throghout the winter. Scientists reveal that ash from a coal contains lead. According to the study conducted on 2005, if we consider that annual coal consumption of Ulaanbaatar city amounts 5 million tons, 309 tons of lead is estimated to be released per year. Thus 48 thousand children living in Songinokhairkhan district are at the highest risk of lead poisoning. February 13 (UB Post) Despite a wind chill of minus 12 degrees, families filled National Garden Park this past weekend for the 2017 UB Winter Festival. The family-friendly event, organized for its second year, was initiated to develop winter tourism in Mongolia through engaging outdoor performances and the playing of modern and traditional games, such as archery, ice ankle bone shooting, family relay races, a snow art contest, ski and snowboarding competitions, and ice chess. Ice wall climbing, cycling tours, and dog sledding were also available for visitors to experience at the festival. Mayor of Ulaanbaatar S.Batbold spoke at the opening of the UB Winter Festival on February 11, noting, "We're organizing UB Winter Festival 2017 for families this weekend. This festival is very significant for developing winter tourism, promoting national winter games, and increasing the number of tourists visiting Mongolia. We hope to broaden the scope of UB Winter Festival to the same level as winter festivals held in other large cities situated in cold climates. National customs and clothing are the highlights of UB Winter Festival." The festival gave local small and medium-sized enterprises the opportunity to promote their products. People who attended the festival were offered free warm drinks and sea buckthorn juice, and had the chance to purchase gifts in preparation for the upcoming Tsagaan Sar holiday. Many people arrived at National Garden Park wearing colorful and fashionable deel. The festival's organizers held a special competition to give prizes to one man, woman, and child wearing the best and most unique traditional outfit. A prize was also awarded to a family wearing the best matching deel. The festival featured animal shows and performances by artists of the Ulaanbaatar Ensemble. One of the most impressive performances was that of long song singer D.Shijirmaa, which combined electronic music with the traditional mouth harp. A festivalgoer who had participated in UB Winter Festival 2014, held at the Tuul River, said that this year's event was much more fun and held on a larger scale. "This weekend, I'm having a really good time with my family," he said, and encouraged others to participate in the next festival. On the second day of the festival, families were able to enjoy performances by contortionists, a parachute team, and a children's 4-wheel ATV parade. February 13 (news.mn) The Ulaanbaatar Investment Summit-2017 will be held on 20th of February. The business forum is being organised by the Ulaanbaatar City Administration in cooperation with the Ulaanbaatar Chamber of Commerce. The forum aims to support economic development of Ulaanbaatar city, to protect business interests, to develop public-private partnership and to create a good business environment for investors and enterprises. Mongolian government officials, ambassadors, representatives of the UB City Administration, members of AmCham as well as delegates from international organisations, local companies and investors will be participating. During the forum, infrastructure projects and tenders to be implemented by government and international investments in this spring will be announced. MOSCOW, February 13. /TASS/. Moscow expects Mongolia's statue in the Shanghai Cooperation Organization (SCO) where that country is an observer to be elevated, Russian Foreign Minister Sergey Lavrov said on Monday following talks with his Mongolian counterpart, Tsend Munkh-Orgil. "We discussed the issue of Mongolia's involvement in the SCO as an observer, but do hope this status will be elevated," he said. "Anyway, our Mongolian friends can presently cooperate without restrictions in implementing the SCO programs in security, energy, transport, agriculture and the regional anti-terrorist bodies." The Russian minister also noted the parties' close or concurring stances on the key regional and global issues. "We agreed to hold special consultations on foreign policy planning this quarter," he said. "I believe that was a very useful agreement." Founded in 2001, the Shanghai Cooperation Organization (SCO) includes Russia, China, Kazakhstan, Tajikistan, Kyrgyzstan and Uzbekistan, with a number of countries - Mongolia, Pakistan, India and Iran - granted observer status. The organization's key objectives are strengthening stability and security over its vast area, the fight against terrorism, separatism, extremism, drug trafficking, development of economic cooperation, energy partnership, scientific and cultural cooperation. Ulaanbaatar, February 13 (MONTSAME) Mongolia and Japan will mark 45th anniversary of the establishment of diplomatic relations on February 24. On the occasion of the anniversary, an opening ceremony and a photo exhibition were held on February 10 at the Ministry of Foreign Affairs of Mongolia. The Government of Mongolia is attaching great importance to the anniversary and is planning to celebrate the event throughout this year. In the scope of the anniversary, a committee to organize the anniversary celebration led by the Minister for Foreign Affairs was established by a government resolution and a plan has been approved. The committee comprises of representatives of public and private organizations, NGOs and entities such as Mongolia-Japan Parliamentary Friendship Group, Ministries of Foreign Affairs, Finance and Education, Culture and Sciences, the Governor's Office of Ulaanbaatar, Mongolian National Public Radio and Television and Mongolia-Japan Friendship societies. In the frames of the anniversary celebration, about 45 events are planned to be organized this year. For instance, the aforementioned committee is planning following measures, reciprocal visits of the authorities of the legislative bodies of Mongolia and Japan, an academic symposium, documentary movie and brochure on the history of Mongolia and Japan relations, fashion show on Mongolian traditional clothing, trade exhibition of Mongolian cashmere products, a concert of State Morin Khuur Ensemble in Japan and Japanese cultural events, Komaki Ballet and Ikebana Show of Japan in Mongolia. JEJU, Feb. 13 (Korea Bizwire) – The Jeju Tourism Organization, in coordination with local tourism bodies in Ulaanbaatar, Mongolia, is opening two "Mongolian Olle Trail" routes in June, inspired by the famous Jeju Olle Trail on the South Korean island. The first route, stretching 14.5 kilometers in distance, starts at (and returns to) a village on the outskirts of the Mongolian capital with a view of local volcanic cones, through a small forest, and by traditional yurts (ger), while the second route is an 11-kilometer walk through Terelj National Park, a UNESCO World Heritage site. Two additional routes will be established by 2019, officials said. The JTO will be responsible for not only the development of the trails and their maintenance, but also will share its expertise on tourism, including helping Mongolian officials boost the operational efficiency of tourist infrastructure like tourism centers and academies. The Olle Trail in Jeju, which consists of a dozen routes, stretches about 422 kilometers along the island's coastline. The word "Olle," taken from the old Jeju dialect, refers to a very narrow alley or path from a public street to the gate of a house. Mongolia has successfully extended access to pre-primary and basic education since its transition to a market economy in the 1990s. In June 2015, with a World Bank loan of US$30m, the country began work on the Education Quality Reform Project. So far, 640 projects across 635 schools have been implemented with grant funding ranging from US$2,000 to US$3,000. February 14 (World Bank) Nearly 30% of Mongolia's population are under the age of 14, and 12% are under the age of five. With so many young children, the country has successfully increased access to basic education, but Mongolia is now placing a sharper focus on improving the quality of primary and secondary education. In light of the rapid changes and emerging issues the country is facing – managing its mineral wealth, handling urban migration and wrestling with economic imbalances – focusing on the development of future generations has gained even greater importance. Since its transition to a market economy in the 1990s, the country has made strides on getting more children to school: current national net enrollment rates of 90% and 82% for primary and secondary education are comparable to other middle income economies. In 2008, the entrance age into primary school was lowered from eight to six years of age, and the basic education cycle was extended from ten to twelve years. The first cohort of students to have completed the full twelve-year cycle will graduate in 2020. But the quality of teaching in primary and secondary schools in Mongolia is an area of prime concern for the government. Preliminary findings from a World Bank report found that the teachers' training system is not very dynamic and is currently falling short. The instructional time in schools is also relatively low. To address these issues, the government is implementing the Education Quality Reform Project with US$30 million financing from the World Bank. The project focuses on improving students learning through better assessments of their skills, improving teachers' training and supporting schools through small grants. The third pillar is a so-called "Talent Program," which is a school support program to increase discretionary spending at the school level to provide further educational enrichment opportunities and increase educational quality. Since implementation began in 2015, 640 school projects in over 635 schools have been selected and awarded grants ranging from US$2,000 to US$3,000. Some of the schools' proposals were aimed at developing students' abilities through the arts: one school in Ulaanbaatar's district of Nalaikh purchased musical instruments to establish a musical band at the school. In the Songino Khairkhan district, a morin khuur band was set up where students learn to play the horsehead fiddle, a country symbol. These young players have already been invited to play at Sukhbaatar Square during Naadam, a major national festival. In the Bayanzurkh district, a grant also helped the establishment of a Science Lab and the purchase of learning materials and instruments such as microscopes to engage students in experimental activities and increase their interest in science. The schools in the Bayandelger district of Tuv province – the birth place of the famous Mongolian poet Natsagdorj – are creating a small theater stage to provide a space for reading, play, and the development of acting skills. While more schools are selected and put their grants' money to work, children across Mongolia today have more opportunities to explore new interests and develop skills. Ulaanbaatar, February 13 (MONTSAME) On February 10, the National Library of Mongolia held a ceremony to receive UNESCO's certificate of registering xylograph edition of 'Merged Garakhiin Oron' or 'Towards attaining wisdom'. The xylograph of 'Towards Attaining Wisdom' glossary was included in the Asia-Pacific Registry of the Memory of the World by UNESCO in May 2016. In order to prove the high preservation, durability and replicating the potential of xylography, "Culture of Mongolian Xylography and Towards Attaining Wisdom" exhibition took place with over thirty exhibits on this day. The xylography was made in 1924 in the Agiin Datsan (Buddhist school) of Buryatia at the initiative of the Mongolian Institute of the Chronicles and Documents (now known as the Mongolian Academy of Sciences). Also, an exhibition organized to introduce 'Tsog Tsagiin Khurden" cultural center's project to make three hundred copies of the cyrillic edition of Kanjur and Tanjur sutras. The cultural center has finished translating 280 volumes and printed 120 volumes as of now. David and Geoff were two BBC journalists who took voluntary redundancy as their mid-fifties approached. Deciding there had to be more to life than golf or gardening, they set off on an 8,000 mile drive for charity to the Mongolian capital, Ulaanbaatar. Their trip takes them across Ukraine, Russia, Kazakhstan and Mongolia. Lying in wait are corrupt cops, bent border guards, mountain tracks and the Gobi desert - but there are also welcoming and curious locals keen to help the two men on their mission and keep them supplied with beer. February 13 (Al Jazeera) Herders in Mongolia say erratic weather events are destroying their way of life. Dry summers that are often followed by extreme winters are killing many of their animals, making it difficult to earn a living. Al Jazeera's Pearly Jacob reports from Selenge. February 13 (GoGo Mongolia) Snow and mild snow storm is expected for Western aimags and some parts of Central aimags on Feb 14 and for most regions on Feb 15. WESTERN AIMAGS: Mostly cloudy. Snow is expected at night in Western parts and at day in Northern parts. Winds from SW will reach 4-9 m/s and 12-14 m/s in the Altai mountains. Night temperature will be -30C to -35C in Uvs lake hollow, Khuren belchir, Ider, Tes river basins and day temperature will be -18C to -23C. CENTRAL AIMAGS: Mostly cloudy. Snow is expected at night in the Khuvsgul mountains and at day in Northern parts. Winds from SW will reach 6-11 m/s. Night temperature will be -28C to -33C in Darkhad hollow, Yuruu river basins and day temperature will be -17C to -22C. EASTERN AIMAGS: Decreased clouds. No snow. Winds from NE will reach 5-10 m/s. Night temperature will be -25C to -30C in Kherlen, Onon, Ulz and Khalkh river basin and day temperature will be -4C to -9C. GOBI AIMAGS: Decreased clouds. No snow. Winds from W will reach 7-12 m/s. Night temperature will be -7C to -12C in Umnugobi and day temperature will be 1C to 6C. ULAANBAATAR CITY: Mostly cloudy. No snow. Winds from SW will reach 4-9 m/s. Night temperature will be -25C to -27C in Yarmag and -16C to -18C in other areas while day temperature will be -5C to -7C. February 13 (The Scotsman) An Aberdeen University researcher is following the footsteps of Sir David Attenborough by studying the relationship between snow leopards, ibex and livestock in the wilds of Mongolia. An Aberdeen University researcher is following the footsteps of Sir David Attenborough by studying the relationship between snow leopards, ibex and livestock in the wilds of Mongolia. Zara Morris-Trainor is living in a ger, a traditional Mongolian tent, during her spell in the east Asian country, where she hopes to gauge the impact of the cashmere industry on native species. With global demand for the material on the rise, herders have expanded the goat numbers, a trend which it is feared could have an adverse effect on species such as ibex, as well as their endangered predators, the snow leopard. Ms Morris-Trainor's work involves interviewing herders while stalking ibex in the field and determining the size of the native populations. She said: "It has been an incredible experience in every way. From the stunning landscape to the phenomenal people I've met. Even -20C weather this winter couldn't put a dampener on the experience." Ms Morris-Trainor's trip was made possible after she received the Sir Maitland Mackie scholarship, named after the founder of the Scottish ice cream business. The scholarship was set up by the university in 2015 to promote research into renewable energy, environmental land use and sustainability. However, she has found little in the way of familiar sweet treats during her stint in Mongolia, where the diet includes suutei tsai, a salted milk tea, and aarul, a dried curd. She explained: "Mongolian food is a bit polarising but I still find myself craving a cup of suutei tsai as a pick-me-up, whether it's sweltering or freezing outside. Some of the more unusual meats like camel and horse are delicious and the herders make an amazing variety of dairy products." Ms Morris-Trainor, originally from New Zealand, added: "I'm so grateful to get backing in the form of the scholarship, as without vital funding like this it simply wouldn't be possible to conduct my research in this way." Mac Mackie, managing director of Mackie's of Scotland, said: "We were fortunate to witness the majesty of snow leopards in the recent second series of Planet Earth, so it is amazing to think that our farm in Aberdeenshire is helping in the effort to understand the big cat's plight." February 13 (Washington Post) It was December when the first reports started coming in: All across the frozen Mongolian steppe, saiga were dying. The antelope species, with its tawny coat, ringed horns and incongruous oversize snout, has roamed the world's chilly northern grasslands since the Pleistocene. But the International Union for Conservation of Nature now deems it critically endangered. And in the past two months, the rare Mongolian subspecies Saiga tartica mongolica has been decimated by a deadly virus. "You can literally look out across a plain and see sick individuals and carcasses," said Amanda Fine, a veterinarian with the Wildlife Conservation Society in Asia. The organization said this week that a quarter of the Mongolian saiga population has been lost to the small ruminant plague, or PPR. The virus evolved in Africa and normally affects livestock like goats and sheep. But it has spread in recent years, first to the Middle East, then to Asia. Fine and her colleagues think it probably was introduced to Mongolia via livestock imported from China, then passed to the saiga in the grazing areas the wild animals share with domestic herds. This is the first time PPR has been identified in saiga, and the impact is pitiful to see. The virus initially infects the animals' nasal cavities, producing crusty secretions around their noses and eyes. Then it migrates into their lungs, causing pneumonia. The animals struggle to breathe, stretching out their necks and gaping their mouths in an attempt to get more air. They stop eating and become dehydrated. When PPR infects domestic goats, it kills anywhere between 30 and 90 percent of the herd. Carcass counts of the Mongolian saiga suggest that 2,500 animals — a quarter of the population — have already died, Fine said. The rate of infection seems to have slowed, but it has not run its course, and the virus could flare up again when the animals congregate in the spring. The saiga have been in decline for decades, a result of habitat loss, hunting and poaching for their horns. By the start of the millennium, there were just 50,000 left — a 95 percent decline from their numbers in the 1970s. The creatures were added to the IUCN Red List of endangered creatures, and conservation work started in earnest. By 2015, the efforts were starting to pay off. The global population of saiga had grown to 300,000. In Mongolia, numbers jumped from fewer than 1,000 to nearly 10,000. "As they gathered to give birth, an increasing number of females became weak and uncoordinated, dying in a matter of hours. Soon a vast area stretching over hundreds of kilometers was littered with corpses." More than a year of research revealed that the proximate cause of the die-off was Pasteurella multocida, a usually harmless bacteria that resides in the animals' respiratory tract. But the overarching cause — the factors that made P. multocida suddenly so deadly — was more complex. Stress from short-term weather changes, compounded by the physiological strain of giving birth, probably made the saiga vulnerable to infection, setting off a "cascading effect of virulence," the vets wrote. Fine sees a link between these two die-offs. Not a direct one — the Kazakhstan outbreak was caused by a bacterium, while the current Mongolian plague is viral. Plus, the two populations are separated by thousands of miles and the Altai Mountains. "But I think we probably are looking at similar situations in the sense that these populations are highly vulnerable to the introduction of new diseases and the stress that goes along with that and factors that can trigger it," she said. Because they recently were so close to extinction, because their ecosystem is undergoing change, because they increasingly come into contact with humans and their domestic herds, and because of some less-than-ideal traits of their own (like the habit of gathering by the tens of thousands to give birth), saiga are especially susceptible to being devastated by a fast-acting infectious disease. "That is the silver lining here," Fine said. "We don't have a mystery disease. There is something we can do." The competition will be broadcasted by live on Fox Sports. Ulaanbaatar, February 13 (MONTSAME) Mongolian judokas grabbed a silver and a bronze medal at the 2017 Paris Grand Slam, took place last weekend, putting the national team at ninth place in overall ranking. The competition attracted 431 judokas from 60 countries. On the first day, State Honored Athlete and First in her weight in IJF ranking M.Urantsetseg claimed silver medal in women's 48 kg. In men's 90 kg, O.Duurenbayar won bronze medal on the last day. O.Duurenbayar made the semi-finals by beating wrestlers from Brazil, Kyrgyzstan and Tunisia. In semi-finals, he was defeated by Ryu Shichinohe of Japan with clean sweep in extra time. After this, he won the bout with Georgia's T.Guram with clean sweep, satisfying for the medal. February 13 (Inside the Games) Every wrestling match from the Olympic Games in Rio de Janeiro has been made available on United World Wrestling's (UWW) official website, the sport's worldwide governing body announced today. The move comes as part of the collaboration between UWW and the Olympic Channel, which launched on the day of the Rio 2016 Closing Ceremony on August 21. Wrestling has had a presence on the Olympic Channel since its launch with its own dedicated sports page and the agreement allows fans of the sport to relive the Rio Olympics action. "The Olympic Channel gives our fans the content they want to watch," UWW President Nenad Lalovic said. "Our fans are some of the most passionate in the world. "They asked for this access and we are now able to provide it for them." Russia and Japan were the most successful nations at last year's Games, where the sport's action took place at the Carioca Arena 2 on the Olympic Park in Barra da Tijuca. The Russian team finished at the top of the medals table with nine, four of which were gold. Japan also claimed four golds but ended with seven overall. Japan's Kaori Icho proved to be one of the stars of the Games as she made history by clinching a fourth consecutive Olympic gold medal. Icho, a 10-time world champion, won the 63 kilograms title at the Athens, Beijing and London Olympics before she secured the 58kg crown in Rio. There were also several controversial incidents during wrestling events at Rio 2016 as the UWW suspended judges Temo Kazarashvilli of Georgia, Tong-Kun Chung of South Korea and Russia's Sergei Novakoskiy for "suspicious officiating". It came after Uzbekistan's Ikhtiyor Navruzov's quarter-final with Puerto Rico's Franklin Gomez in the men's 65kg division. There was then further controversy involving Navruzov when he beat Mongolia's Ganzorigiin Mandakhnaran in a bronze medal bout. Mongolian coaches Tserenbaatar Tsogbayar and Byambarinchen Bayaraa removed their clothes in protest at the result and claimed the judges had "supported" the Uzbek. They were both given three-year bans from the sport, while Mongolia's national wrestling federation was fined CHF50,000 (£40,000/$50,000/€47,000). Ulaanbaatar, February 13 (MONTSAME) Young violinists of 'Anu music' violin studio, M.Anujin, M.Anungoo and D.Sanchirmaa each won second place in an international music festival 'Kreshendo' held in the USA. The festival had started receiving records played by participants since last December and selected young violinists were invited to play in the Weill Recital Hall of Carnegie Theater in New York. On February 12, the three violinists of Mongolia participated in the Gala concert and received certificates for winning second place in the festival. Children from all states of the USA as well as Russia, Canada and Germany competed in the renowned festival 'Creshendo'. February 13 (UB Post) For the first time in history, a Mongolian beauty pageant qualified in the Top 11 finalists of Miss World 2016, held last December at the Theater MGM National Harbor in Maryland, USA. 26-year-old A.Bayartsetseg, who represented Mongolia in the biggest global beauty pageant event, received the most votes from thousands of people from across the world and won the Best Video Introduction nomination and People's Choice Award, which earned her direct entry in the Top 11. She then won Miss Talent award at the grand finale for her magic and calligraphy art performance. Miss Mongolia 2016 A.Bayartsetseg goes in depth about Miss World 2016 and her plans to build an acting career in the interview below. Congratulations on making a historic success at Miss World 2016. Thank you. I returned to Mongolia on February 3. There's no place like home. I'm able to rest quite well here. Can you share your feelings right after being announced as one of the Top 11 finalists at Miss World 2016? As you might expect, my heart was racing until the moment they called out my name. I felt quite queasy when they announced Miss Korea as the 10th finalists. But I tried to calm myself thinking that there's still the 11th place left. I felt like bursting in tears when I heard the host call out "Mongolia". I was extremely moved since I received votes from thousands of people. You stayed with beautiful women from across the globe for over a month. Have you made many friends during the event? I was with beauty pageants from 130 countries while preparing for the contest. I learned many things and made many good friends. I became quite close with everyone except, Miss Kenya, who became the top fifth contestant. Miss Indonesia and I hit it off very well – maybe because we shared a room. I became friends with Miss Dominican Republic as soon as I arrived at our accommodation. I have to say that 19-year-old Puerto Rico's Stephanie Del Valle, who was crowned Miss World, is a really talented woman. Before we talk about your time at Miss World, there's something we need to clarify. Is it true that you were asked to audition for the role of Mulan in Walt Disney's live-action adaptation of "Mulan"? Will you audition for the role? Catching the eyes of such a large agency and being invited to audition is such a rare occurrence. After the contest ended, I went to the interview as asked. I'm sure they'll take their time choosing the lead actress. I plan to focus on acting and spend more time improving my skills from now on. Mongolia and the Philippines got similar scores for the Miss Talent contest. What was the contest like? That's right. Since the beginning of Miss World 2016, Miss Philippines and I worked as a team. We're really good friends now. She told me that she was really impressed with my performance for Miss Talent. It's probably because around 50 contestants sang as their talent. My performance was different from theirs. It was the first time someone did a magic trick at the Miss World beauty pageant. This might be why a lot of people paid attention to my performance. Using this opportunity, I'd like to express my gratitude to everyone in my team and everyone who voted for me. How did you feel when you were announced Miss Talent? Miss Talent is announced a day before the grand finale and whoever is selected as Miss Talent secures a place in the Top 25. It was really amazing when they actually announced me as Miss Talent. The population of the Philippines is nearly 100 million. It is the home of many beautiful beauty pageants. Compared to the Philippines, Mongolia has fewer people, yet we were able to work really efficiently. This is a huge opportunity. My success is proof that Mongolians are strongest when we are together. The girl who represented the Philippines became a runner-up because she sang like many other contestants. On the other hand, I was able to impress the audience and judges by doing something different – by combining dance with calligraphy and a magic performance. I also wanted to show something different and I'm glad I was able to do that. You posted on social media that a gift from People's Artist N.Suvd bolstered your luck during the Miss Talent event. Can you tell us more about this? Yes, People's Artist N.Suvd, whom I respect tremendously, gave me the hair accessory she wore for "Mandukhai Tsetsen Khatan" film. I wore it for the second round of the talent show. I felt much better and luckier while wearing it at a decisive moment. You celebrated your birthday while participating in Miss World. How did you spend your birthday? My 26th birthday happened during Miss World 2016. It was really spectacular because I got to celebrate it with gorgeous women representing every corner of the world. It was a really unforgettable birthday. The Mongolian Embassy even sent a cake. The organizers had planned a very interesting event and sang the Mongolian version of "Happy Birthday". A lot of girls told me that I was able to get more attention since that day. I kind of agree with this because I'm sure more people became aware of me as so many people prepared for my birthday. People with different personalities from different cultures gather for the Miss World beauty pageants. Who would you say was the most entertaining out of all those people? Countless fun things happened during the month we stayed together. I made many friends as well. I would say the funniest person was Miss Guine-Bissau. She spoke in Portuguese and never left my side because we became really good friends. Whenever something happened, she would ask me to translate for her. I spoke in Spanish but she spoke in Portuguese. Sometimes, there were really difficult things to translate but I tried my best to help her understand. Then, we asked Miss Brazil to help us out and all sorts of funny things happened. I'm always proud to be a Mongolian no matter when or where I am. My recent success was all thanks to my team. I experienced and learned many things while participating in Miss World. People can't succeed alone. I managed to go into the grand finale thanks to a strong team united under a single goal. I didn't have that many staff, but as the contest progressed, our fellow Mongolians showed how strong we can be. It was absolutely amazing. The secret to my success this time was truly my amazing team. American actor Steven Seagal openly supported you during the contest. What was it like to meet him in person? I got the chance to meet Steven Seagal when I was in Los Angeles. He gave me tons of useful advice. I'm sure everyone knows but Seagal's wife B.Erdenetuya, also known as Elle, actively supported me during Miss World 2016. I feel like every Mongolian likes to encourage and support other Mongolians no matter where we are. You directed "Yazguur Lugaa" (Back to Roots) film. When will it be released? I have a full list of things I'd like to try. One of them is traveling. I started traveling after I got a scholarship from the European Union during my sophomore year in university. My parents found it hard to allow their only daughter to go abroad all of a sudden. I started challenging myself more since then. After thinking about the things I'd like to try, I ended up filming "Back to Roots" documentary film with my friend. Right now, I need to fix some things. I didn't have the time to work on this documentary last year so I intend to finish it this year. The filming took place at herder N.Munkhuu's ger in Erdenemandal soum of Arkhangai Province. I lived at a herder's home for two months to film "Back to Roots". I plan to make short films with my friends. When do you plan to marry? I don't want to speak about my boyfriend at the moment. I hope you understand this. I don't plan to make drastic changes in my life, especially when it comes to starting a family. First, I want to pour all my efforts into achieving my goals. You posted about your travel to Myanmar on Facebook last year. Did you plan to go to Myanmar for a long time? I shared a room with a beauty pageant from Myanmar for a month during Miss Earth 2015. We became really close friends and kept in touch since. Then, I got the opportunity to judge Miss Myanmar contest and travel so I shared it with my Facebook friends. I came along several historic and interesting places connected to Chinggis Khaan. I felt really proud when the tour guide shared histories related to Chinggis Khaan throughout the tour. My trips to so many Asian countries with rich history and culture are making me stronger. Is it true that you're going to the Philippines this month? I managed to do a lot of things during my stay in the USA after Miss World 2016. Though I haven't been back for long, I'm planning to go abroad again. I'm going to the Philippines on February 26 because I have to give a presentation at an international youth meeting. "BACK TO ROOTS" is a creative feature documentary film about saving cultural identity among young people who are losing their our own cultural core value day by day in that fast pacing world. Here is the location scouting trip the team had in Arkhangai Province in January, 2015. Ulaanbaatar, February 13 (MONTSAME) The capital city Ulaanbaatar and Khuvsgul and Khentii aimags will be developed as tourism centers of central, western and eastern regions. The Ministry of Nature, Environment and Tourism has set out on a mission in 2017 to work for it. A consultative meeting of the administrative officials engaged in the nature, environment and tourism industry is being held today, February 13 at the 'Corporate' hotel. Some 160 delegates are discussing how to develop the tourism centers and other issues and policies and plans of the sector. Khentii province has started implementing 'Chinggis Brand' program with the support from the Environment Minister and historic tours are planned to be organized in the birthplace of Chinggis Khaan and in other places historically relevant to the great khaan. Officials of the Ministry noted that good progress has been made in legal reform of the environment sector since the formation of the new Government. Amendments to the law on Special Funds allow Mongolia to get financial support from 'Green Climate Fund' to implement projects and programs. The ministry is working to develop over 10 bills and amendments to some legislations, including laws on Casino, Air, Garbage and Environment protection. '- The 21st century is an era for blue 'gold'. A recent nationwide water survey revealed that 120 rivers and springs out of 200 in the eastern region are dried out. There are incidents that mining companies abandon the mined areas without restoration or with poor rehabilitation. We work to improve the legal environment so that the responsibilities on mining companies are tightened by considering the illegal act as crime against nature and environment. Unfortunately, Mongolia is considered one of countries where climate change occurs fast' said the Minister of Nature, Environment and Tourism Kh.Oyunkhorol.